The FM radio on the Samsung B7300 OmniaLITE has a really neat and simple interface and can automatically scan and save the available stations in your area. It also has RDS support and automatic scanning for an alternative frequency. This means that if you travel during reception, the OmniaLITE should take care of auto-switching to the regional frequencies of your selected radio station. The handset also supports radio broadcast recording and of course can be minimized to play in the background. There is room for only six shortcuts for your favorite stations on the radio app screen. The audio quality of the Samsung B7300 OmniaLITE is somewhat of a mixed bag. The extremely low noise level and stereocrosstalk as well as the excellent dynamic range are the strong points of the OmniaLITE performance. The frequency response is good for most of the range but the cut-off bass frequencies aren't allowing us to qualify is as anything more than decent overall. 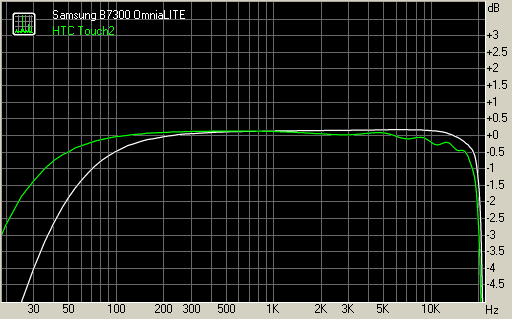 The total harmonic distortion is the worst part about the OmniaLITE audio output, going several times higher than usual. It's not that it is too disturbing but we are used to seing a lot better from most other handsets. The Samsung B7300 OmniaLITE is capable of taking 3 megapixel photos with a maximum image resolution of 2048 x 1536 pixels. There is no flash of any kind and no two-step shutter key, so you should probably lower your expectations right now. The B7300 camera viewfinder is familiar to us from the Omnia II (and most other recent touchscreen Samsung handsets for that matter). The comfortable interface is nicely touch-optimized and has all you need in the two vertical taskbars on each side of the viewfinder. There are a good number of configurable options here - ISO, white balance, default storage, mettering method etc. However, extras such as Wide Dynamic Range and image stabilizer have been omitted. At least there is geotagging support on the OmniaLITE allowing you to record current location in the image EXIF. The list of extras is competed by smile shot, and a dedicated panorama mode. We are not particularly impressed with the image quality of the Samsung B7300. While the amount of resolved detail is decent we find the noise levels higher than usual. The colors also look pretty dull. 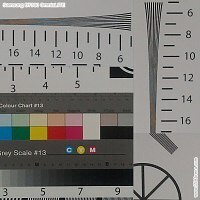 At least there is no loss of fine detail in the photos and no traces of oversharpening. 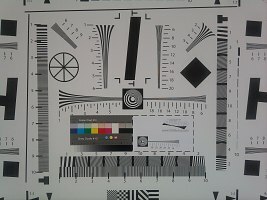 We also snapped our resolution chart with the Samsung B7300 OmniaLITE. You can check out what that test is all about here. As far as video recording is concerned, the OmniaLITE can offer VGA resolution (640 x 480 pixels) at 15fps. Needless to say, this kind of specs are nothing to cheer about. So despite the decent camcorder interface we doubt it anyone will consider taking videos with their OmniaLITE seriously.